Indeed, the world continues to look to the UN secretary-general to stand up for the principles of the organisation. One of the highest responsibilities of the incumbent is to help steer a course toward realising UN goals in the areas of peace, development, human rights and humanitarianism. The secretary-general must navigate the power configurations and political currents of the UN membership as well. And he must strive to be the moral voice of the world. 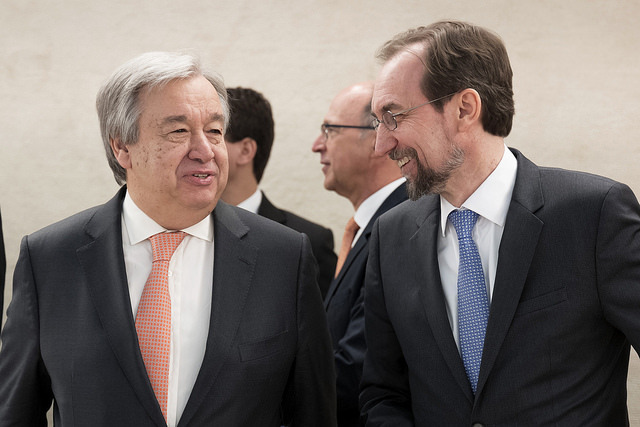 Featured photo: Secretary-General Antonio Guterres with Zeid Ra’ad Al Hussein, United Nations High Commissioner for Human Rights during the High Level Segment of the 37th Session of the Human Rights Coucil. 26 february 2018. UN Photo / Jean-Marc Ferré licensed under CC BY-NC-ND 2.0. This article first appeared on PassBlue, and has been reproduced with the author’s kind permission.